Dr. Amin is the proud owner of Avenida Animal Hospital, he received his bachelor degree in animal science from Cairo University in Egypt in 1985 finished his internship in Tuskegee University In Alabama. After years of veterinary practice he became owner of Avenida Animal Hospital in 2006. Strong interest in soft tissue surgery and internal medicine, Dr. Amin continues to attend conferences and continues educational lectures and seminars to learn new methods of diagnosis and treatment. 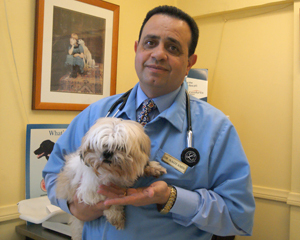 Dr. Amin has a peaceful and warm attitude with pets. You will feel safe knowing your pets are in his expert care. He is a member of AVMA, CVMA. He is married and has 2 kids and 2 dogs. He enjoys soccer and spending time with family and friends.